Russian President Vladimir Putin on Thursday extended Moscow’s embargo on food products from the West to the end of 2019, continuing its retaliation against sanctions over Ukraine. A decree signed by Putin and posted on an official government website says the embargo on produce, dairy, meat and most other foods will now stretch to December 31, 2019. Moscow in August 2014 banned most food imports from the European Union, the United States and other countries after they imposed sanctions over its annexation of Crimea and support of east Ukraine’s separatists. In late June, E.U. leaders agreed to extend their punishing economic sanctions against Russia over the conflict in Ukraine for a further six months. 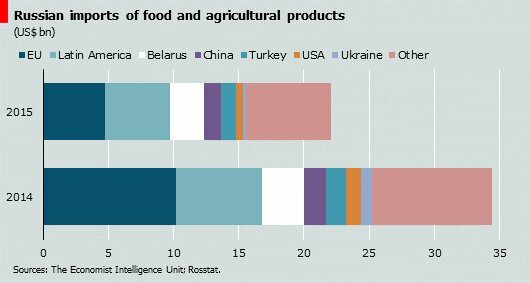 The Western sanctions, as well as Moscow’s own embargo, have affected the Russian economy, pushing food prices up and quality down, but also giving a boost for some domestic producers. Life Under Sanctions: How are Russians Taking it?